Fresh tasting mix with sherry vinegar dressing. Delicious with a selection of cheese. Suitable for vegetarians.Recently our travels took us to the sunny Mediterranean, where street markets burst with sights, sounds and smells to tempt the taste buds. 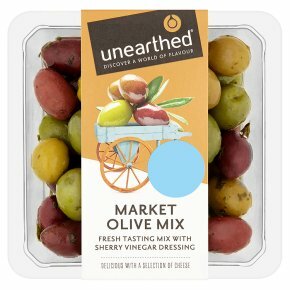 Inspired by what we discovered there we created this mouth-watering mix of Kalamata, Nocellara and Manzanilla Olives. Add to that a zesty lemon & sherry vinegar dressing, and our market olive mix is something seriously special.